We are here to help! Post a free message for the finder and get our alerts. 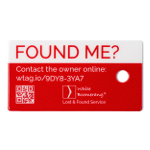 • Your location based message will be easy to spot for the finder. • We keep you updated about possible related finds in the area. • Communities share it on social media and get a ready to print flyer! Fantastic! Post a free message for the owner while we keep you protected. • We are updating owners who are looking for this in the area. • It's safe! Your contact details stay always private with us. • You can anonymously chat to verify it is the right owner. recover lost keys, bags, phones and more. My 5 year old boy today lost his ty teddy it was a little dog which is brown and white and has glassy eyes. We retraced al our steps but his name is Duke and my little boys was heartbroken. It would be great if we could be reunited! I found a males wedding ring (with various diamonds on it and a mix of gold and silver plated) on the train approaching Canary Wharf Station (towards Stratford) this morning at around 9am. The ring was handed in to DLR staff at Canning Town station, who said they would pass it on to underground staff. I hope it's owner is able to locate it! Lost set of 3 keys: 2 Yale-type, 1 5-lever mortice key, on a ring with a miniature Richmond Borough library card. Dropped between East Sheen & Barnes Station, or on train to Vauxhall, or on 87 bus to Westminster, or on the return journey. Apple air pods and case found near Fulham Football Club. I can see a name on them if I hold them close to my iPhone. I lost my black Eastpak backpack around Borough Market/London Bridge train station just after midnight last Thursday to Friday night (18-19th April). Amongst other things there were blue trainers in it. Found a black touch unlock iPad at Stockwell station Northerline towards Edgware via Bank around 9 AM , please contact me. Lost pink purse!! With numerous card in: bank cards, student card and membership cards! Also had £50 cash inside!! Set of keys dropped by a cyclist on pentonville road as he was travelling towards Kings Cross. Keys were left at the Pentonville Road entrance to Kings Cross station. it was a metallic coloured wallet with plenty of cash inside, around £1500. Its all the money I've prepared for the trip. If you've seen it, please contact me. Found ladies polo Ralph Lauren scarf near waitrose Greenwich. I know these are very expensive. 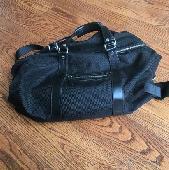 I lost my black weekend bag in Clapton last night, 22nd of April, after midnight. It has my clothes and documents. Please return for a generous reward! Found a set of keys on crossing at Piccadilly Circus lights this morning at around 8.30am. 2 keys - 1 with green key cover, 1 with red glittery nail varnish - 1 key ring with CCALCP on. Black nike (mauve tick) sports bag containing boxing gloves and gum shield plus padlock and hounslow borough fusion card.